Excerpts from my endless trip through the fabulous world of traditional Québécois music. As a musician (and designer and writer and visual artist) born and raised in New England, I never suspected that I would one day be an immigrant, a legal alien, living on foreign soil, speaking another language and (for all practical purposes) devoting my life to a form of traditional music that I hadn’t heard of until the day I became best friends with late, great Franco-American singer and defender of her culture Martha Pellerin. Although I’d been a musician for most of my life, even while holding down day jobs, and had been active on the folk and bluegrass scenes for a good portion of that, somehow I had never crossed paths with Québécois music. Maybe because I was a guitarist and singer, rather than a fiddler. Maybe because I went to university in upstate New York and then moved to Atlanta, Georgia. Whatever the reason, my fate was sealed when Martha and I formed Jeter le Pont in the late 1980s Not long thereafter, we made our first recording (a cassette), with help from musician friends in Québec. One thing led to another, and long story short, I eventually found myself married to Québec fiddler Claude Méthé (Martha introduced us of course) and began what has become a lifelong trip through the unique culture and music just over the border from my then-Vermont home. Thank god for my eight years of French in the American public school system. In July 1997 I drove across the border (well actually I made at least seven trips, one in a 32-foot truck with a five-month old baby), leaving behind my small, rural Vermont town and bringing along my three young children and an eclectic menagerie of farm animals plus one guineau pig, to a small, rural Québec town located about one hour and a half north of Montréal, in the Lanaudière region, famous for its living musical traditions. We moved here because we knew so many musicians already and had recorded several albums in a local studio famous for recording traditional music. Lanaudière is often called the nombril (bellybutton) of Québec trad. Once you climb the hill to our village, except for the power lines, cars, snowmobiles and all-terrain vehicles, life hasn’t visibly changed much over the last two centuries. Québec might be the most homogeneous society existing in North America today. While there are francophone communities sprinkled throughout Canada (where 9.5 million people speak French), Québec is the largest, with 7 million French-speakers, roughly 95% of the population, and the only one in which French is the official language. If you spend time here, you’ll discover that for French-speaking people of my age and younger (I was born in 1956), “French-Canadian” is a term that is rarely used. “Québécois” is how they think of themselves. Those older than I, on the other hand, might call themselves a Canadien, their way of saying that they are ethnically French-speaking Québecois. In Québec, the term “national” refers to the what you all know as the province of Québec rather than the entire country of Canada. We even use the expression “Rest Of Canada” (or ROC) on a regular basis. Confused yet? In case you didn’t already know, many Québécois (there is some proof that it is a slight majority) are still hoping to separate from Canada and becoming a sovereign nation, and the province has long behaved as if this is already the case (there are Québec government offices, sort of “consulates” in at least twenty major foreign cities, I believe that there are six in the US alone). Lanaudière is purported to be the most separatist region of the province. The complex issues of language and sovereignty make life very interesting. While I’m not a highly political person and not sure if I can qualify myself as a full-on separatist, I was ready for the adventure of living in a newly-minted nation and held off applying for Canadian citizenship until this year, but I finally resigned myself to the idea that I will have to swear my loyalty to the Queen of England (Canada is a Constitutional Monarchy) when they approve my Canadian-ship. Don’t tell the Queen, but as a dyed-in-the-wool New Englander, I will be crossing my fingers behind my back. But that is another story. New to the immigrant experience, I was immediately struck by how useless a phonebook is unless you know the precise street address of the person you were searching for. It is not unusual for there to be five, ten or more pages of the same name in the bottin (phonebook) of Joliette, the nearest large town. Nearly everybody seems to be related by blood or by marriage and I stand out like the proverbial sore thumb with my extremely unpronounceable foreign name (I am regularly addressed as Madame “White”). Even my Québécois husband’s last name raises eyebrows that say “You’re obviously not from around here”. At the local bank, whose slogan is “Ceci n’est pas une banque”, which I couldn’t agree with more, I actually overheard them refer to me as l’Anglaise (the English) while I was waiting in line to be served. Here, most people went to public school, which unlike the US, is Catholic, thus they’ve all shared the same basic religious and moral upbringing, know the same stories, confessed to the same sins, prayed to the same saints. My own three children didn’t know much about religion until they went to their first Morals class, a relatively new alternative to Religion class for those who don’t actually attend church, which is a lot of people these days, even here in the boonies. Until we built a new house on our small farm property, we lived in a tiny, 150-year old home that didn’t have plumbing or electricity installed until 1964. We could still choose to use les bécosses (backhouse) if desired, and once we had a visit from a family who lived in the house in the 1950s with their ten children. They kept the butter in the (outdoor) well, which made me think twice the next time I complained about the house being too small for our family of five. At home and in town I don’t hear much English from anybody but my immediate family. One of my children used to request that I not speak French in front of his friends while another, usually at the same time, asked that I please not speak English – it’s apparently a common immigrant dilemma and one to which I never found a good solution. The very up side of this profound homogeneousness is that the musical culture of rural Québec is vibrantly alive and remarkably preserved. A friend who works with elementary school children told me about the time he was taken by surprise on a fieldtrip with a group of young children from Saint-Côme, just north of here and know for its song heritage. As the bus left the schoolyard, they all began to sing a chanson à répondre (call-and-response song). Everybody knew the words, and the singing didn’t stop until they reached their destination. It was a similar story on my own kids’ schoolbus — they sang on the way there and back daily, including the older kids, (but not necessarily traditional songs). It’s what their families did at social gatherings. In comparison, when doing school workshops in Vermont before moving north, we often asked children about the music that went on in their homes. While there were exceptions, too often the response was that nobody played or sang in the household. Kids were dying to touch our instruments. Some couldn’t even think of one song. This was equally true when we did workshops in greater Montréal schools. But here in my small village, I was involved in a folklore project at the local elementary school that required all who signed up to show up for singing practice with their favorite Québec song, and thirty-three kids signed up (the whole school was 125) and almost all of them had a traditional song to sing! Québec is certainly the richer for having preserved so much. The demographic of large families, rural isolation, a small bank account and a lack of competition from other amusement (i.e. television, which isn’t much better here than in Vermont without a cable connection) certainly conspired here to cultivate the musical soul. How much longer it will last I don’t know, however. I was saddened to see the same school present talent night with recorded music and lipsync (not even karaoke!) performances from the very same children who could stand up and sing a dozen traditional songs. And it was the music teacher’s idea to use this approach. With art and music being cut left and right everywhere in North America, I fear for the health of all cultural heritage. Despite the glaring lack of support for the arts in schools, there is a slowly growing appreciation of traditional music as the public everywhere becomes more and more branché (internet connected). Just search YouTube or Google for “québécois trad” and you’ll see. While we are behind in many ways here, festivals and house concerts are finally coming into vogue and they introduce the public to music – including their own – that they didn’t know existed. 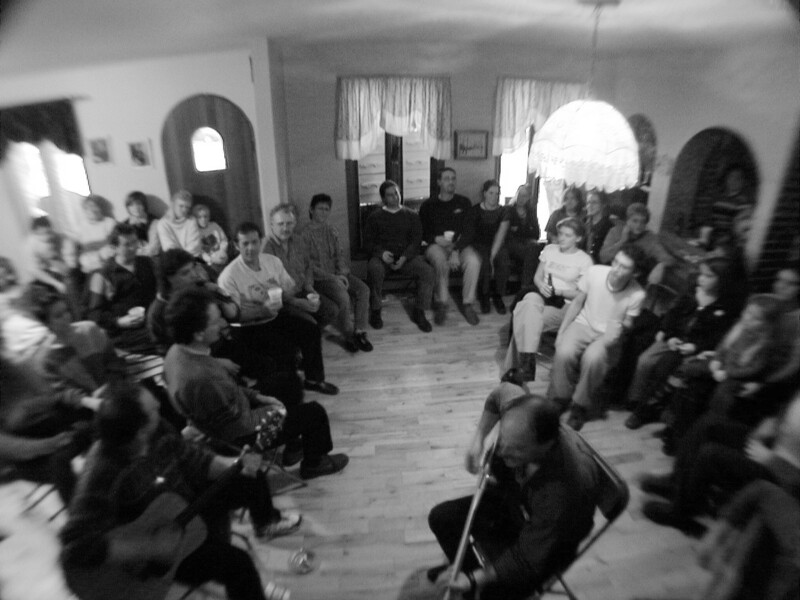 For most Québec trad groups, like any “ethnic” music, there are usually more gigs to be had outside of the province where the music has an exotic appeal. After all, the definition of “world” music is basically music from your hometown played somewhere else, right? It takes a certain amount of recognition à l’étranger – outside – to get the attention of the folks back home (like presenters and arts funders), but it happens. So if you’re a trad musician, you want to get famous somewhere else first, if possible, which may embarass your own people into supporting your art. Québec is fond of claiming people as theirs when they get noticed by the media – Zachary Richard who suffered bad reviews in Louisiana but sold records and got on a TV show here; Kathy Reichs of Bones fame who is or was a forensic specialist for the city of Montréal; Angelina Jolie who apparently bought an apartment on the Plateau; Madonna who is related to Nicolas Ciccone and whose mother was a Fortin which supposedly makes her my husband’s distant cousin as well (this doesn’t seem to have worked out in his favour that I can tell). Which brings me to dance : traditional Québécois called dance is also enjoying increased popularity due to avid urban fans, a mixture of those (older folks) who remember dancing in the kitchens of their youth and the established (anglo) contradance scene, which is pretty established with granola-ish types on both sides of the border. As is true in many places that have strong musical traditions, we are just as proud, perhaps even prouder, of the “kitchen” version of our music, the songs and tunes that happen naturally during parties. While many musicians today find their traditional inspiration on recordings, archival or commercial, as well as on the internet, live transmission is still an important part of local culture here. Musical repertoires, whether instrumental or vocal, are commonly attributed to specific families or individuals; this goes for different versions of songs, as well. Locally, many a group has been the beneficiary of selections from the magnificent repertoires of the families of this region. It would even be possible to record entire albums of the same song, all sounding completely different! I’m proud of the fact that nearly all of the traditional songs I sing myself were learned directly from a living source – a visit to a friend’s home, a party, a supper that ended up in song. But I think it’s wonderful for all traditional music that people can learn it from a recording or even from YouTube; it’s the passing it on that counts in the end. While still living in Vermont, I was lucky enough to spend a lot of time with family acquaintances of my best friend and musical partner Martha Pellerin, who was the first child in her family born outside of Québec. The family spoke French at home and nearly all of their friends were others who, like them, had emigrated to Vermont for work during the mid-1950s, even before there was a true border crossing. Now, after many years in Québec playing catch-up on Québec popular culture, I recognize that their personal repertoires were frozen in time once they left their culture behind. The music and social life they shared with us were all they had left of the deep roots left behind them in their hometowns. Martha and I had private “sessions” with her mother’s friends, women in their 50s and 60s. We would sing our version of songs we’d collected from family and friends. The women (5 or 6 of them) would sit at the kitchen table, pencil and paper in hand, taking notes on our delivery. Sometimes, while we were still singing, they’d look at each other and begin shaking their heads disapprovingly. We continued on nervously but clearly we were doing something wrong. When we finished, instead of the indignant criticism we were bracing ourselves for, they’d begin to argue among themselves about the lyrics or the refrain. Everybody had a different way of singing certain songs and theirs was the right way! We also got gigs singing for tour bus loads of Québécois women on shopping trips to northern New Hampshire outlets. They’d put us up in the hotel for the night, the women would come to a lounge after a day of buying Ralph Lauren at a discount, and we’d sing. Amazingly, the exact same scenario ocurred. The looks. The head shaking. The arguments. Finally, they even began singing their version loudly over ours, drowning us out completely until we gave up and “assimilated”. We knew when to throw in the towel! In my tiny village, where just like 100 years ago, I still don’t benefit from haute-vitesse (high-speed internet), parties may begin mid-morning on a cold winter day – the cows are in the barn, the fields lay dormant under four feet of snow, construction is halted until Spring – building up steam as the beer, caribou and music kick in, with a never-ending stream of food set out on makeshift tables. It is a tradition – perhaps stemming from the revéillons,the meal following midnight mass – to be served a huge buffet around 1:00 or 2:00 am, a brilliant idea considering the spirits that have been consumed by then. Meanwhile, the music goes on non-stop until les petites heures. There might be twenty or thirty people playing and singing at once, with song after song arriving spontaneously from some seemingly inexhaustible source. At my own parties, after nodding off at 5:00 am to a magical trad orchestra going full-tilt in my living room, I can usually count on getting up to start the coffee and finding one of my musical neighbours snoring on the couch, fiddle or accordion nearby. Instrumentally, Québec traditional music typically includes some or all of the following : fiddle, accordion, guitar, piano and foot percussion. While accordion was introduced after the fiddle, it’s popularity was quickly established and has made it symbolic of Québec music. As a backup instrument, the piano was on the scene before guitar, and is more common to dance music. Similarly to the US, many homes had a piano, which was considered something of a status symbol. In reality, most instrumental music (fiddle, accordion) was played without accompaniment to get people up and dancing in — where else — the kitchen. Today, you’ll find mandolin, bouzouki, flute, bass,banjo, percussion and many other instruments being incorporated as musicians experience influences from other world cultures and genres of music. While considered a trademark of Québécois trad, the origins of foot percussion have never been definitively proven. Some say it comes from First Nations people, some say it was invented by Québec fiddlers to keep time while playing for dances, still others say that it has European roots. We’ll probably never know. But whatever its true origins, podorythmie is a handy tool and even some musicians outside of the Québec tradition have learned the technique from their interaction with touring artists (and probably videos). While it was associated with fiddlers in past decades, today guitar players are as likely to be the band’s designated foot-tappers (and I can’t tell you why,even though I am the podorythmiste in my own band!). You can watch this if you’re curious about what it looks and sounds like. There is also much debate about the origins of what is considered French fiddle repertoire, as many of the tunes that we think of as über-Québécois are identifiably Celtic-rooted. French, Irish and Scottish residents of Québec have a long and colourful history of working together in the chantiers (lumber camps) and have crossed paths all across North America during the days of the voyageur, fur traders who travelled the continent by canoe, leaving in their wake towns with French names that are horrifically pronounced today by Americans and Canadians alike. There are tunes shared with the Métis peoples (native and European mixed) across Canada and even Inuit fiddlers play some of the same tunes you’ll hear at jams here. But the tunes played by the late Aimé Gagnon of Lotbinière county, Québec, my husband Claude’s mentor for many years, are not like any others you’ll hear. I, too, had the pleasure of playing with him many times, and always felt that his music seemed to come from another time. It lead us to wonder whether perhaps they are indeed from some long-lost European French repertoire, before the fiddle was forgotten or somehow replaced by other instruments. Perhaps it is simply that the early colonists were too busy trying to stay alive in cold, harsh Nouvelle France to keep up with the simpler pleasures of life that they enjoyed before coming to Québec.Traveling during the winter months, when life moved indoors and slowed down, was not an option as it had been in their homeland, making it more of a challenge to socialize on a regular basis. In fact, one of the way tunes were passed on was by way of the wandering quéteux, a kind of freelance handyman who would exchange work and music for a bed and a meal as he made his way across the province. 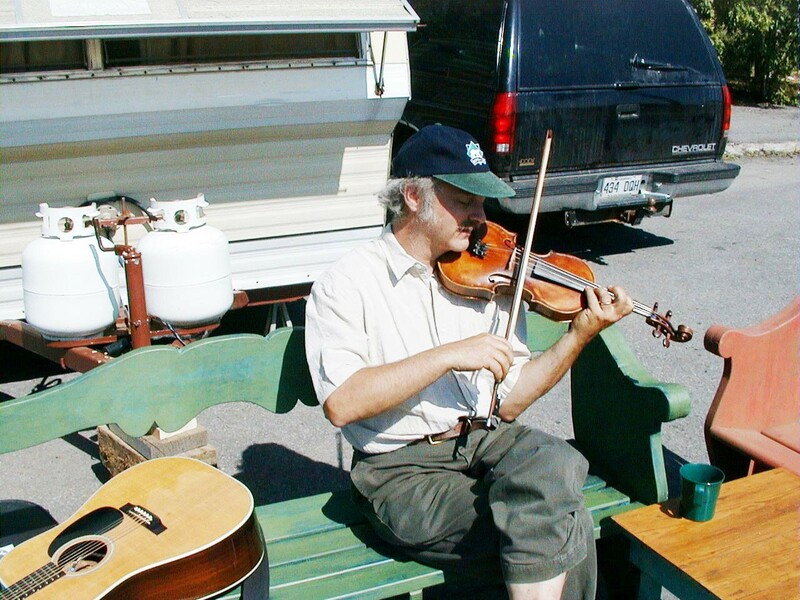 Aimé Gagnon himself learned tunes from the renowned Quéteux Tremblay, who as an itinerant fiddler, composer and collector of tunes stopped by at the Gagnon home each year during his travels. Whatever its genetic origins, there is an undeniably Québécois sound and swing that distinguishes the style and repertoire. It has a rhythmic intensity that is a thousand miles away from Irish music, which is more melodically oriented, like water flowing continuously in a stream, all about the tune. For me, Québécois music is always invoking dance; it is music about moving, it can be competitive and fierce, even macho. It shares a tribal element with all Celtic-rooted music but the swing is so very North American and sets it apart from its Celtic cousins. While I sometimes think it is closer to Scottish music than to Irish,there are no Québécois slow airs; sorrow tends to be saved for songs. Traditional Québécois music is seriously intense, but rarely serious or ominous. The expression joie de vivre is used over and over again to describe it, so I’d venture to say that this music seeks to be happy by default, maybe to counter the will of the Church that so controlled life during the province’s earlier days. While fiddlers from each region of Québec have their own style, there is always something that ties them together. The fiddle was what got people dancing (even though the Church disapproved of this). The sound of twenty fiddlers playing a Pitou Boudreault tune like La Belle Catherine gives me goosebumps; there is nothing like it! The sound of feet beating out the rhythm is also something that never fails to excite those listening. It is powerful music, without a doubt, and the range of interpretative styles on the traditional music scene is vast. In the 1970s, groups Le Rêve du Diable and La Bottine Souriante were among the first in the province to reacquaint the public with their own musical heritage. These groups’ take on the music of their forefathers (and mothers) was full of youthful spirit, urgently played fiddle tunes, rough-hewn vocal “arrangements” – still a dirty word in some circles – and most of the kitchen-y essence left intact, and it kickstarted a trad revival. Their music was born into an era that followed closely on the heels of American folk music à la Dylan, Baez and the likes, and it fit well into the new nationalistic feeling that was developing as the province warmed up for the first referendum on independence in 1980. But the rebirth was not long-lived. With the loss of the bid to separate, sentiments toward Québec folklore quickly changed. With a loss of self-confidence in the value of their uniqueness as a society, few wanted Québec to be symbolized by a form of music that was often associated with uneducated ruralism. Some intellectuals and city-dwellers, who had no direct, personal connection to this heritage, mocked and devalued it in important media interactions. Sadly, there are still traces of this attitude today, encouraged by those who would like to purge Québec of anything smacking of the folklorique (read : unsophisticated). This situation is not unique to Québec, though – it is typical of the fight everywhere for preservation of anything artisanal, the ongoing battle to recognize that patrimoine (heritage) is important as are all traditional arts, like storytelling, weaving, cheesemaking, etc. Traditional arts are not unlike nearly-extinct species – when they appear to be making a comeback, support fades away. The argument is often made that “they’ll keep doing it anyway.” This might even be true – but it is not a logical reason for not funding something as important as cultural heritage. An analogy can be made with old-time music in the US. How many people, upon hearing the words “old-time” still picture a guy wearing a plaid shirt, suspenders, long beard, armed with (heaven forbid!) a banjo? In Québec, we battle the image of traditional music as something that is reserved only for le temps des Fêtes (Christmas holidays). The public at large seems to think that it doesn’t exist during the other eleven months of the year. But like all good folkies everywhere, we have to use guerilla tactics – and social networks, of course – to continue to help our cause. Not long after I first came to Québec, with a group of folk and trad peers, I co-founded L’Association Folquébec with the goal of developing a presence for Québec-made folk music (including trad) on the international music scene. For more than a decade, Folquébec has presented countless showcases in Canada, the US and Europe and became quite a well-known “brand” for Québec folk and trad at the biggest conferences, where, operating with a miniscule budget, our concerts and late-night jams garnered a lot of buzz. Little did they know that we were frequently sleeping five to a room and living on granola bars, peanuts and smuggled-in beer! In 2012, Québec’s National Assembly awarded a Medal of Honour to Le Rêve du Diable for their contribution to the preservation of Québec’s musical heritage, and in the past few years, there has been a movement to reclaim and legitimize the word folklore in hopes of removing its pejorative status. More recently, a group of Montréal-based trad musicians started Commando Trad, a flash-mob-inspired project that has large numbers of musicians suddenly pulling out instruments and playing, stepdancing and singing in public locations across the province. The events have received media attention in North American and can be seen on their YouTube channel. Created by Jean Desrochers and Véronique Plasse, the project has also made its way across the sea to France and Germany. So perhaps our efforts are not in vain. This piece can currently be found on Medium.com and includes portions of articles written for Folker magazine (Germany), the bulletin of the North American Folk Music & Dance Alliance (US), the magazine of the Country Music & Bluegrass Association of Italy and the Local 1000 AFM newsletter (US).